The lives we lead can feel like a simulation as the line between our reality and augmented futures continues to blur. 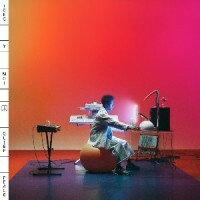 Following the ever-emotive Boo Boo, Toro Y Moi’s new album Outer Peace is a time capsule that captures our relationship to contemporary culture into one comprehensive, sonic package. Shortly after the release of his 2015 record What For?, Toro Y Moi (also known as Chaz Bear) packed up his belongings, leaving the comfort of his Oakland base for the relative solitude of Portland to write Boo Boo. Apart from the familiarity of his surroundings, Bear focused on what would become his next sonic statement. In doing so, he was struck by the reign that technology holds over our day to day lives and its ability to obscure the consumption of creativity. His change of envi- ronment resulted in freedom from disturbances and, in those quiet and tranquil spaces, the creation of music acted as a protest in favor of peace. Having now moved back to Oakland, Bear’s new record Outer Peace is a response to the lessons gleaned while making Boo Boo — a response to the expendable state of art that is a product of instant grati cation. Bear’s ingenuity reveals a multifaceted expression of his universe on this record. It’s the space be- tween the accessible and unconventional where he invites us to experience Outer Peace, which is rooted in nding peace in antithetical conditions: being stuck in traf c, hustling for your next check as a freelancer and all other chaotic moments in life that require digging beneath the surface to nd solace. As both a producer and designer, Bear utilizes abstract sound pairings with recognizable samples for his most pop in uenced record to date. This is no de- parture from his funk and disco roots, which can be heard on “Ordinary Pleasure”, later fusing into variations of house with tracks like “Freelance” and “Laws of the Universe.” Smooth interludes melt into fast paced beats, paralleling the feeling of driving through the Bay Area, where Bear spent most of his time writing the album. Outer Peace is duality. It embodies whatever form you choose to inhabit in the moment. Listen and let your imagination become the universe. Barry says: Another great LP from Toro Y Moi, pulsing beats and smooth synths all wrapping around the machinated vocal delivery. Working it's way between the dancefloor and home listening, with enough activity to keep you moving, but imbued with the kind of languid beats and euphoric basses that a more horizontal position can benefit. Perfect.